News | Six planning and place-making projects, delivering quality outcomes for Greater Sydney, have been named as winners of the 2018 Greater Sydney Planning Awards. 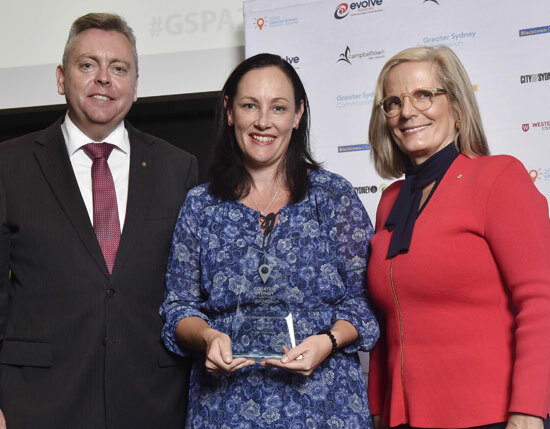 The awards, presented by Minister for Planning and Housing, Anthony Roberts, and Greater Sydney Commission Chief Commissioner Lucy Turnbull AO, cover six categories across great places, infrastructure and jobs planning, sustainability and community engagement. “The projects we are celebrating with these awards include a health and education precinct in the Western City, the creation of great spaces at Barangaroo, a campaign to get more people cycling locally, a strategy to address urban heat and the strategic planning that delivered the Western Sydney Parklands,” she said. “We need to keep focusing on the simple ‘people’ things – how easy is it to get to the shops, do we have jobs nearby, can we walk our children to school, do they have parks to play in? Our city needs to work for people with all sorts of needs and our planning must cater for them first and foremost,” Ms Turnbull said. Minister Roberts said, “Good planning and development is more important than ever if we’re going to make Greater Sydney a metropolis of three liveable, productive and sustainable cities and one of the world’s indisputable great cities. “It will be a Greater Sydney filled with opportunity for us, for our children and for those who want to call this city ‘home’, with choices for housing, jobs, green spaces and vibrant places to enjoy,” the Minister said. “The Parklands corridor was first identified in the 1968 Sydney Region Outline Plan, with the Office of Strategic Lands identifying and acquiring the lands that now comprise the Western Sydney Parklands,” she said. “Not only are the Parklands a significant part of the Sydney Green Grid, they will help meet the recreational and leisure needs of Western Sydney now and for future generations,” Ms Turnbull said. Judges’ comments: The Give Yourself a Lift campaign exemplified strong and comprehensive community engagement by helping the residents of Green Square make positive behaviour changes including challenging their reliance on cars for short trips. The judging panel also noted the campaign’s strong alignment with the Commission’s goals - with particular reference to sustainability. Judges’ comments: “City of Parramatta Council’s work on infrastructure funding for the Parramatta CBD is an ambitious project that acknowledges the challenges of transforming Parramatta into a global city. Through detailed and rigorous technical analysis, the proposal has gone to great effort to be transparent in its methodology and has strong credibility. “The judging panel notes the common principles between the plan and the Commission’s own Growth Infrastructure Compact and applauds the plan’s guiding principle of ‘equitably sharing the benefits of growth’. Judges’ comments: “ASPECT|OCULUS’ work on Barangaroo South helps bring to life a vision of a highly connected and sustainable Eastern City. “Streets are alive and vibrant, and the precinct is highly-utilised by locals and visitors. The panel hopes to see more community uses for the precinct as it evolves. Judges’ comments: “The Quarter is a fantastic example of cross-government collaboration underpinned by broad engagement and clear direction. The health and education precinct is home to knowledge-intensive jobs, with strong potential to be an economic engine for the Western City. Judges’ comments: “Penrith City Council’s Cooling the City strategy demonstrates strong local government leadership in the sustainability space and a practical approach to achieving positive outcomes for Penrith. The judges also acknowledged School Infrastructure NSW for its School Assets Strategic Plan 2031. These are the second annual Greater Sydney Planning Awards, conducted by the Greater Sydney Commission.